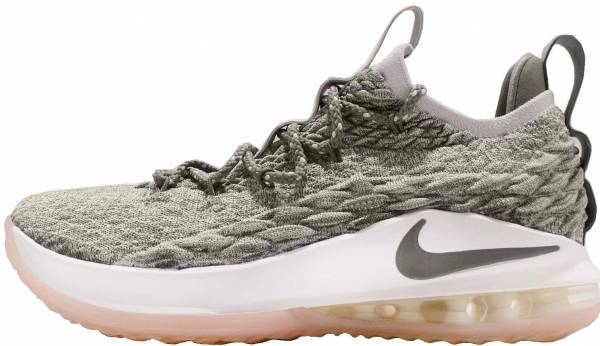 Most users say that the light and soft Battleknit upper of the Nike LeBron 15 Low provides a flexible and durable fit. Several users enjoy the remarkable setup of the Air Max and Zoom Air. The combination provides stunning comfort and impact protection. A great number of buyers mention that the LeBron 15 Low has really attractive colorways. The ankle collar of these LeBron James signature Nike basketball shoe is stretchable enough for the foot to slide in easily. The majority of the users appreciate how breathable these LeBron basketball shoes are. The design of the upper has a 3D reptile effect that fascinates plenty of buyers. Bigger and heavier wearers love the impact protection provided by the Air Max cushioning at the heel. The pliable deep grooves on the outsole deliver maximum court control and grip. The traction pattern favors guards because it grips court floors well with their lateral movements. A good number of testers claim that the Nike LeBron 15 Low fits wide-footers because of its flexible Battleknit upper. Unlike the high-top LeBron 15, these low-top basketball shoes come with an outrigger which helps with stability. Lighter athletes cannot feel the Air Max unit at the heel. They say the claimed responsiveness at the midsole is non-existent. A handful of testers do not the recommend the shoe model for outdoor use because of how soft and pliable the rubber outsole is. A few users mention that they do not like the Air Max in the LeBron 15 Low because it rides high. Overall, the Nike LeBron 15 Low is a great basketball shoe. Most shoe owners recommend this shoe for bigger and heavier players like centers because they can maximize the feel of the Air Max unit at the heel through their weight and more forceful impact upon landing. Moreover, many LeBron 15 Low owners appreciate its Battleknit upper, saying that they are amazed at how strong and flexible it is. Users enjoy wearing the 15th shoe as much as the LeBron James 16th Nike basketball shoe. While the Nike LeBron 15 was a great shoe for those that didn’t require a lot of lateral support and stability, the Nike LeBron 15 Low changes all of that to become a shoe that anyone can enjoy on court. For $150, I definitely think it's a pretty good shoe. The LeBron 15 Low is such an improvement over the past years’ lowtop models that it really isn’t fair to compare them. The last five years have felt like the low was just to say there was one — and so you could have an LBJ logo on your summer shoe. The LeBron 15 Low feels like a game shoe, an actual design for playing that is close to the normal shoe but just different enough to warrant a new release. The shoe feels more guard-oriented, with a lower ride and stiffer cushioning for a fast game — especially with the curved forefoot and the transition it provides. If you are a lighter player that never bought LeBron’s because of the boot-like fit and feel, here you go. Even for heavier players that didn’t like the higher midsole, the LeBron 15 Low is a find. The Nike LeBron 15 Low was released on March 31, 2018 at a whooping $150. Like its high-top predecessor, it has a Battleknit upper that perfectly corresponds to LeBron James’s basketball needs. Aside from the comfort, flexibility, durability, and ventilation that the Battleknit provides, it boasts a beautiful 3D effect on the side panels with its reptile-like texture. Nike puts the Zoom Air unit at the forefoot and Air Max unit at the heel, producing a tag team of cushions that provides a great experience for the wearer. While the high-top LeBron 15 features a lateral traction pattern, the low-top version comes with a multidirectional triangular and spiked pattern. Its deep and pliable grooves are ready to hit different court floors any day. However, some testers mention that the shoe could still be better. Instead of Air Max at the heel, Nike could have placed a regular Zoom unit. Because of this, they kept the shoe out of their rotation. Still, the Nike LeBron 15 Low is surely not a disappointing shoe especially if you are a LeBron fanatic and you have $150 to spare for a low-top shoe. If you have these LeBron James basketball shoes and you don’t like playing hoops in them, you can definitely wear them for casual dates. For sure, with its aesthetic appeal and superb cushioning, your leg muscles are going to be stress-free all day long. Cushion. The bounciness of the Nike LeBron 15 Low is derived from the combination of Zoom Air and Air Max units in the midsole. The Zoom Air at the forefoot provides responsiveness and court feel. As for the Air Max unit at the heel, it delivers optimum comfort and impact protection upon landing. The shoe model has an Ortholite insole to ensure step-in comfort. Traction. The outsole of the Nike LeBron 15 Low is made of a translucent rubber compound. It boasts a multidirectional triangular and spiked traction pattern. While the pattern is known to grip any court surface well, the soft and pliable grooves easily wear off when repeatedly used outdoors. Length and Width. Most reviewers report that the Nike LeBron 15 Low runs long and narrow. They say that the toe box has a dead space which causes foot slippage when running. They advise new buyers to check and fit the shoe before buying. Lockdown. Like the high-top version, the Nike LeBron 15 Low has a glove-like fit. Its upper is reinforced with Flywire, which is a lightweight technology that uses either Vectran or nylon filaments. The lace loops are connected to the Flywire, so the shoe easily delivers dependable lockdown when the laces are tightened. Designed by Jason Petrie, the Battleknit is a state-of-the-art Flyknit created for a huge, powerful, and quick athlete like LeBron James. It is specifically built to meet big players’ need for lightness, comfort, flexibility, softness, breathability, and durability. Stability is delivered by the thermo polyurethane heel counter and midfoot shank. The Nike LeBron 15 Low is styled with 3D reptile-effect side panels. The pull tabs have triple loops for added appeal. This full-bootie and low-top silhouette comes with a transparent heel to show off the beauty of the Air Max technology. Both sides of the LeBron 15 Low displays the prominent Nike Swoosh. As a reminder of where the Zoom Air unit is placed, the medial side has a “ZOOM” callout. Sail. The Sail colorway was released on March 31, 2018. It is described in Nike’s website as Light Bone/Dark Stucco. It simply has a gray upper, white midsole, and a light peach outsole. Supernova. The Supernova colorway is considered a fan favorite. The upper looks like a purple top at a distance. But on a closer look, it is a pattern of multiple colors - blue, black, and red. While the Swoosh of other LeBron 15 Low colorways have a single hue, the Supernova’s Swoosh has an ombre effect of university red and royal blue. This colorway was released on March 31, 2018. White/Metallic Silver. The White/Metallic silver is as dainty as it is. The clean white upper is paired with a metallic silver Swoosh for a neat effect. This colorway was released on April 1, 2018. Phantom. The Phantom colorway’s black upper features a metallic gold Swoosh, and it sits on top of a white midsole. Ashes. The Ashes colorway is set to release on May 1, 2018. This colorway has a black and white upper with a black-speckled white midsole. Flight Pack. Some call it the Melon colorway, the Flight Pack was released in summer of 2018. Dressed in a cool grey upper, these LeBron basketball shoes come with black shoelaces and sunset pulse lace loops. The teal tint translucent rubber outsole is partnered with a sunset pulse heel Air Max unit. Signal Blue. The upper of these LeBron basketball sneakers come with a mix of black, blue, and grey tones. It has a white midsole and a translucent rubber outsole. Team Red. To shower some love to the city of Cleveland, LeBron James and Nike created a Taupe Grey/Team Red-Vast Grey colorway. It features a black-speckled white midsole and a white solid rubber outsole. Some shoe owners call this the Burgundy colorway. Triple Black. Just like other signature Nike models, the Triple Black is an in-demand colorway. It is an entirely black basketball shoe with a thunder grey Swoosh. University Red. Nike releases the University Red colorway before summer officially ends. These Nike basketball shoes have entirely red uppers with white shoelaces, black-speckled white midsoles, and a white translucent rubber outsoles.